Hi good morning I would like to know the best offset for a toyota hiace 18 inches rim please ? 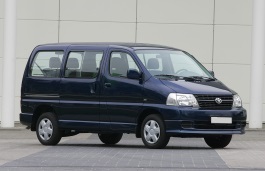 Hi, wanted to know if I can put smaller size rims on my hiace van 03? It currently has 15's on it. Hi,Lyall,I suggest that you does not put smaller size.It will decrease your car performance. Can you please tell me if a set of standard 15" mag wheels and tyre off a 2013 sr hilux 4x4 would fit my 2006 lwb toyota hiace van. Are the offsets the same ? Hi,Bob,For your questions,the offset of them are not same,Hilux is 10mm,but hiace is 29mm.my suggestion is you can try it,But may be need a spacer. Hi,Ken Barratclough,You can change it,but may be need a spacer. Hi,Noor,I suggest that you can use tubeless tire,Because it is more stable.For the size of the tire,yes,the rear wheel tire widder than front wheel tire. Hi. Pls hlp. I have 2011 hiace 6stud. Will 2017 18x7.5 hilux sr5 wheels fit ? If so what tyre size pls? Will it fit inside the guards? Thanks. 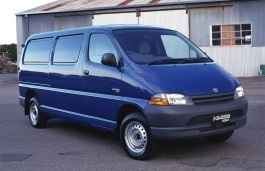 What Tyre size can I use for a Toyota Hiace 1998 model with 18inch rim? Hi,Mike,20'' is to large for 2013 hiace. will the 16" mags from 2005 Toyota kluger fits 2001 Toyota hiace van? they got the same 114.3 x 5, please advice. 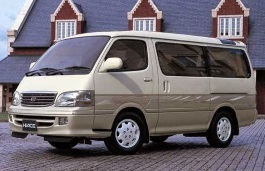 I have a toyota GS300 LWB HiAce Powervan 2.4 diesel UK model which at present has its original 15" steel wheels. I've looked all over for the correct wheel fitment but all I seem to be able to find is details of imports. I know that mine are 6x139 but many sites say the are 108 bore but when I measure the width of the centre cap where it meets the wheel it appears to be around 100 or less. Also the correct offset would be handy. I'm looking to upgrade to 16 17 0r 18" and wondered what other vehicle would fit. Hi,George.I think you can check "alloy wheel fitment+",6*139.7 means the diameter of bolt pattern.your 100 means the diameter of center bore.they are different.The offset need special measure to check.If you want to change to 16-18 inch,you can consider toyota 4runner. Hi I havea 2005 toyota hiace van it has mags with 17 rims first off what is the off set ?and would a set of 17 rims offa toyota Altezz factory mag fit does the off set need to be just bigger then the hiace which i think is 29 ? Will 16 inch wheels from a mitsubushi pajero fit my toyota hiace power van? Hi, judie220801,Try 17*7.5 bolt pattern 6*139.7.Offset 25-35mm. i'm trying to buy locking lugs for my 2000 toyota haice. My problem is the van is being shipped to the Bahamas and I have no way of measuring the lug size. I would like to buy some loking lugs in the US before I go to the Bahamas, can you help? Hi，Robert,According to my data,The lug size is 12*1.25. Are these the right size & how does this effect performance? can I put on wheels from a Hilux? Hi,Bruce,Can you show your exact tyre and wheel size? Does that mean you want a photo ?? Hi,Rob,Yes.it can fit for,But i suggest that you confirm the wheel size again.If it is 15'' for hiace,that will be ok.
Hi,Jay,Can you show me your current wheel size? Hello everyone, im ask toyota fj rim fit to tyota hiace van? Tnx god bless all drive safe. I have a 2007 Toyota Hiace SWB van and want 17inch alloys for it is this possible? thanks in advance. I have a 1996 Hiace RZH113R series campervan, with Five Stud rims with 185/R14C tyres. What would the impact be of upgrading to 15 or 16" rim/tyres (ie. on the speedo etc. ), and what sizes would be best? Hi,t harrington,Can you explain the 2006 4b rims?is that one of toyota hiace rims? Hi there, just wondering if it's possible to fit a set of toyota hilux 2015 factory wheels on a Toyota Hiace 2009 please? At the moment the Hiace has the factory 15' wheels on and the Hilux are the factory 17'. Hi,Dragos Nistor,Yes,it can fit for.And you may need some spacers. Spacers between the wheel and the hub please? I have a Hiace 98 LWB. is it ok to drive? as I don't see the aspect ratio in the tire ..
what would be the aspect ratio ? Front tire diameter would be 11 mm higher than rear, it is possible, but it isn;t OE specification. 195R15 mean that aspect ratio is about 82%. HI,Andy,Yes, you can do it.In fact,15'' is also the stock rims. Hi,Andy,Sorry,Can you explain your question in detail? I have to change my 2 tires in my hiace 2014.. Except for 195R15C size of tires is there any size of tires similar to 195R15C or fit for stock steelrim?. Is it recommended in rear tire little bit wider if front tire?. Thanks for any comment or suggestion..
Hi,Joseph M. Luceña,You can try 195/70/15 for front and 215/65/15 for rear. Hi,Robert Walker,The standard tire size is 205/70/15,So 225/70/17 is uncompatible.For the wheel size,What is the bolt pattern? Hi, I'm struggling to find large load rated rims for my 2016 hiace, must I have a P35 offset? Hi,SpencerCate Munyanduri,The standard rims width is 6.5‘',I think 8'' is too wide. Hi,Lawrence,What the bolt pattern of that rims?Is that 6*139.7? Hi i have a toyota hiace 2010., is there any size of tyres similar to 195R15C 106/ 104R or fit for stock steelrim.? Also 205/70/15 size of tyres are fit to my toyota hiace 2010.? Thanks for any comments or suggestions..
Hi,Khlen,If you want a better drive perfomance,17'' rims is a good choice.The offset you can try 29mm for 15'' and 25mm for 17''. Hi,VICTOR Onyeka,What the bolt pattern of the alloy rims?Does it 6*139.7?If yes,alloy rims and tires can for. Hi,Josh,The hiace have two different bolt pattern,5*114.3 and 6*139.7.Please confirm whether they are same. hey was wondring if i could fit on hiace 2007? Hi,Amrit singh,What the wheel offset of that rims? Hi,Ryan,What the Kmc slide wheel bolt pattern and offset? Hi I have a 97 hiace super custom 114.3x5 currently on 19"rims which are far too big. Are 17" too big also? I do alot of miles with lots of corners and tight turning. I was thinking of 16x7 what do you think?what is the offset? Do Hiace rims 5 stud 1980's fit onto a 89 Hilux 2wd 5 stud pattern? Hi,Brook,For the rims,The offset for Hiave is 29mm,but Hilux have offset 10mm.So,If you want to use it,You may need 15mm spacer at least.And For the tires,Can you also provides the commercial tyres size?It can help to confirm whether it is fitable. Hello, have a 2008 d4d 95 swb currently has black rusty steel rims on, have just bought some new old stock silver rims both dimensions stamped same apart from mine end in ek 21 ones I have just got is ek 19 is this meaning the offset? Will they be ok? bore and Pcd is the same I think. Hi there, I'm thinking of putting 215/65R16 with 16"x7" rims and wanted to know what would the off set need to be. I'm seeing that the stock off set is 29mm. would i need to maintain this? or is there a range that would work? Hi.dominc,You can try offset range from 25-29mm. Hi. My 2001 Hi-ace camper is fitted with 14'x 5 stud rims (not in good condition) and a good set of windforce mile max tyres 195R 14C. Is it possible to buy a set of alloy rims to suit these tyres? Hi,michael windle,yes.When you buy alloy rims,You'd better tell the shopsales you will put it on 195R 14c. 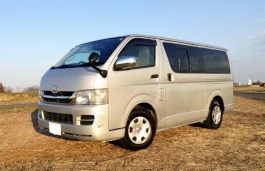 I have a 2012 Toyota Hiace Commuter KDH223R model. I aNt to put a set of 18inc rims, specs are 18x7.5 offset +30. What is the right tyre size and spec fit on the rims and my car? Thanks in advance. Hi,denise,What your current wheel size and tire size,I can help you to confirm. Hi, I have a Hiace GL model 2018. Firstly would these fit and would the tyres rub? Hi,Tommy,Can you show your current rims and tire size?I can help you confirm it. hi, i had 2nd generation hiace h20 1980 with 5 stud rims, can you give me an information that rims, size, offset number and pcd on a standard condition?